Memorial seeking has become a bit like train spotting with many people visiting our villages to seek a memorial, each one traditionally being different and individual to the particular village. There is, unusually, a set of Memorial gates at the back of the Cemetery in Nether Stowey and of course, there are memorial plaques in both St Mary’s Church, Nether Stowey and St Peter and St Paul’s in Over Stowey with every name of the 27 men who died in WWI and WWII from these villages inscribed. 18 of these died in the First World War – a very high proportion of the population which 232 in both villages at that time. 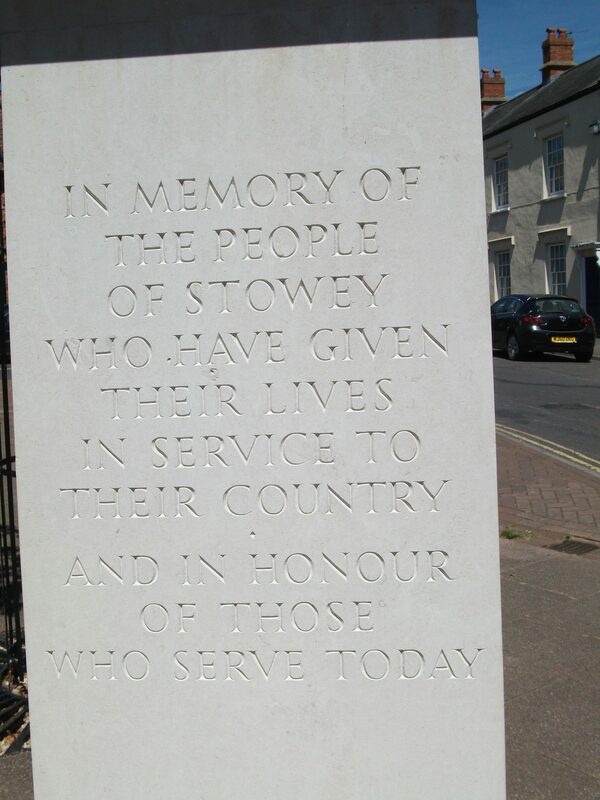 It is perhaps surprising, therefore, that the Stoweys did not have a memorial of their own. 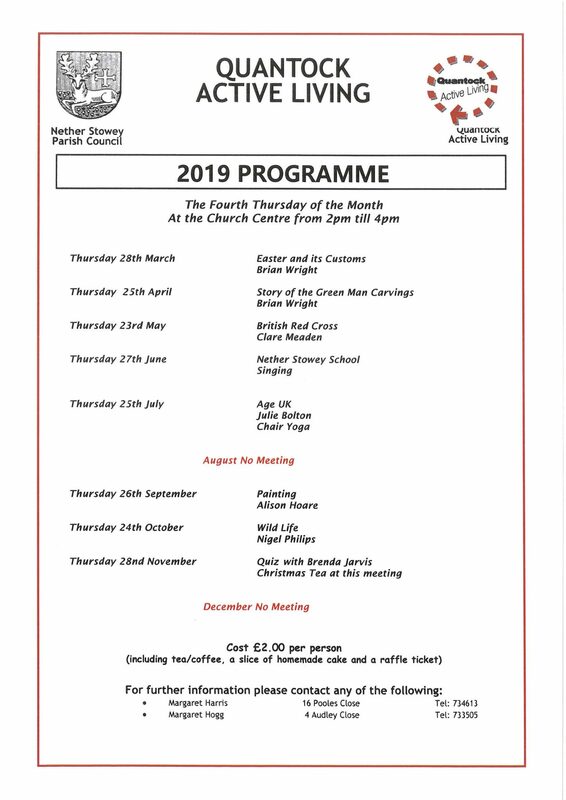 Yet the Armistice or Memorial Day has been held at the Cross in the centre of Nether Stowey every November since 2010 to encourage people to come who do not wish to come to church or who do not necessarily share the same faith. Several villagers having queried the possibility of installing a memorial, especially at a time when the national mood was in support of its soldiers, sailors and airmen, even if not in agreement with the wars to which they were despatched. The suggestion of a new Memorial for both Nether Stowey & Over Stowey was put to the relevant Parish Councils and with their approval put to the villagers. 93% of those who answered were in favour. Of the remaining 7% all but one were more concerned about the cost incurred by the villagers. A Project Group was set up with CANS to plan, raise funds and if possible erect a new memorial. Villagers were kept informed and involved throughout, either through a postal drop or, more frequently, through the Quantock Messenger. A competition was run in conjunction with the school and the Messenger to select a design. A site was selected from several around both villages which would allow peaceful reflection and space for a Memorial Service or occasional gatherings. 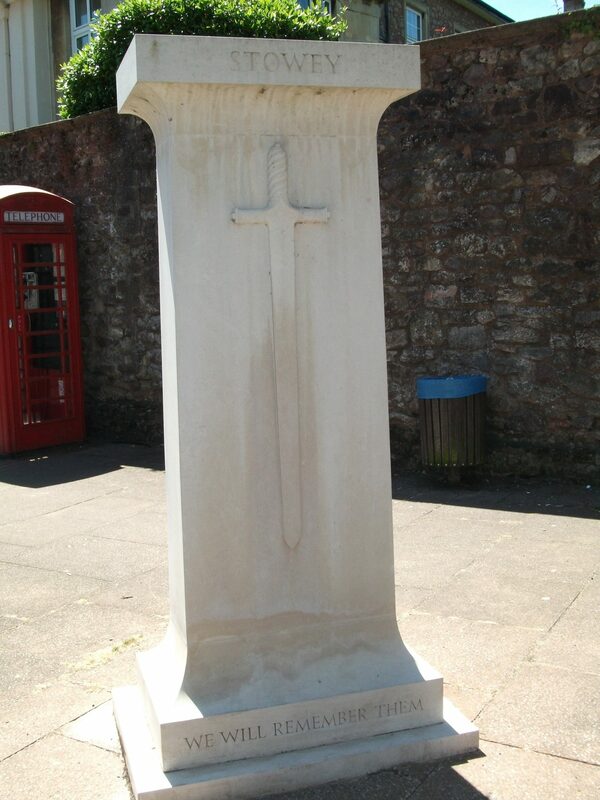 The Cross at Nether Stowey fitted most criteria. Approval was sought from the various authorities and Tom Clarke of Martock was then commissioned to carve the Memorial, chosen by the villagers, from Portland Stone. A team of Guarantors ensured that all costs would be met as they arrived. In the meantime an appeal was launched and fundraising began in earnest with events in each village and through Trusts and companies before finally seeking support from those villagers who wished to donate. Not one penny was provided by the Parish Council from the precept – as agreed at the outset. Viridor Credits sponsored the memorial and ensured that we would have the full funds for the stonecarving. Prince Charles gave his support, as did Lady Gass and a number of other individuals and Trusts so that the funds were raised in full without resort to the Guarantors. On October 27th 2012 the new Memorial was in place and a Dedication Ceremony was held with the Royal British Legion, the Archdeacon and local clergy, dignitaries from County, District and Local Councils, donors and guests with Lord Lieutenant of Somerset, Lady Gass unveiling the Memorial. A sum of £2000 had been raised in addition which was handed to the Nether Stowey Parish Council for future maintenance at which point the responsibility for the Memorial was handed over for posterity. The final act of the Project Group was to create two books recording the history of the memorial and the Roll of Honour for Remembrance of the men who died to be presented to the two Parish Councils as well as the Library in Nether Stowey. Now, not only do the two villages have a memorial to the people who died for our freedom yesteryear but it also honours those serving today and will go on to mean the same for the people of tomorrow.